About: London's premier live music and club venue. Early gig drinks offers available to ticketholders, head down and enjoy a drink before the support band. Home to Club NME every Friday - Expect live bands and resident DJs in the main room, plus pop-up shows and parties upstairs in the Gallery. It's always been a performance venue, but in its 100 year history Koko has been a cinema, a theatre, the epicentre of punk, and the host of some of London's biggest garage nights. It still has the look and feel of an early 20th century auditorium, and is as likely to feature big names like Madonna as up and coming indie bands. "Rubber tyres and sunsets on a Camden roof terrace"
The well known Camden music venue has opened its roof terrace in a bid to provide a summery space for revellers in warmer months. Whilst the views over Camden High Street are not the most picturesque, us Londoners are known to scramble around on the teeniest patch of outdoor space during those brief moments during which we are blessed with sunshine. However, Koko’s roof terrace is considerable in size; at around 850 square feet it can hold a decent-sized party. There is also something rather decadent about milling around on a roof, drink in hand and watching the sun go down over the urban landscape. Koko’s roof is no exception, with the added bonus of being extremely eco-friendly. 6,600 vehicle tyres have been recycled and put to good use by lining the ground, making it softer and ideal whatever your choice of footwear (a serious consideration for wearers of shoes with thin lining). Located right next to the Lounge Bar, the terrace is open every Friday from 5.30 to 10pm and is free for everyone, even if you’re not a ticketholder for a gig. Arriving before 10 also guarantees entry into indie-pop favourite Club NME. Koko’s varied history has seen it go from theatre (in its first guise when it opened on Boxing Day in 1900) to cinema, to music venue to nightclub. Back in the days when Charlie Chaplin regularly performed here, who could have predicted that one day punters would perch on the roof on piles of rubber enjoying the Camden sunset? 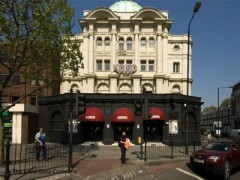 Went to the famous KOKO for the first time this month. The venue itself is legendary, and lives upto it's name as the decor is quite grand. I got there early so didn't notice how long the queue got afterwards. When the doors opened, I was told to join another queue which was for the guestlist - I wish they had told me before! Once we got in, the coat queue was not too long - and at the end of the night I had lost my ticket but they let me describe my coat and got it for me without making me wait until everyone had got theirs because they recognised me and my friend who had his ticket. So that was nice of them. I didn't drink, but the bar service looked pretty good. The show itself was amazing. I managed to get onto the v.i.p balcony and had a great view. Lovely experience. Will go again.